We live in an area where lots of attention is given to the reselling of old goods. If flea markets are your thing, there is a wide selection of places to go and look around from weekend to weekend. Some markets happen in giant fields while others take place inside buildings. The European way is also to see market settings with vendors taking up space on the sides of long streets. Locally in the Kaiserslautern Military Community, each weekend there is a flohmarkt (flea market) staged in the parking lot of the REAL mall complex in west Kaiserslautern, across the street from Kleber and Daenner kasernes on Mannheimer Strasse. Another flea market in an enclosed hall in Ramstein village is open every Saturday while near the library on Ramstein base, a market with about 30 vendors happens one Saturday each month. In the Saar region, a popular market happens on the first Saturday of each month in Homburg. Another good one takes place in Saarbruecken, however dates vary. Check the regular Was ist los feature in the paper for local flea market listings. Still, these pale in comparison to what you can find if you have a bit of time up your sleeve to drive a little. Many people routinely enjoy driving into France and Belgium on weekends, heading to various markets they know about. There are trade papers and community bulletins that come to mailboxes advertising where many good flea events take place. Called “brocantes” or “braderies” in French, flea markets attract people who seek to find bargains on antiques, post-modern home furnishings, household goods, and other bric-brac. 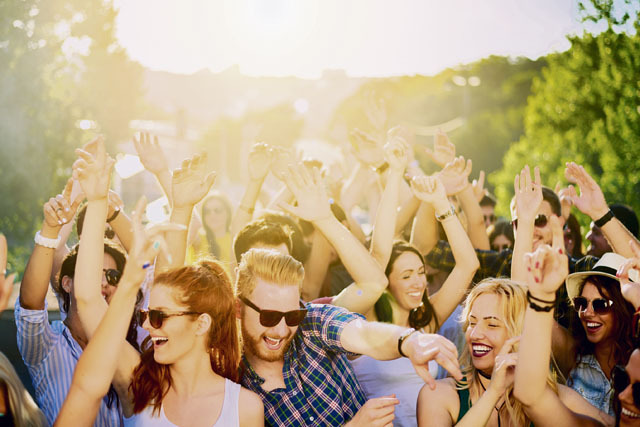 These are events that have something for just about anyone who truly enjoys flea markets. At these types of markets, sellers must obtain permits with local authorities and are generally asked to pay a small fee in order to do business on the day of the market. Brocante and braderie dates are good for local economies and the fee for the seller is usually not too high for this reason. A medium-sized but super market happens once a month 30 kilometers south of Zweibruecken, in the French town of Eguelshardt, where you can also enjoy historic castle ruins and beautiful hiking trails in the Moselle region. 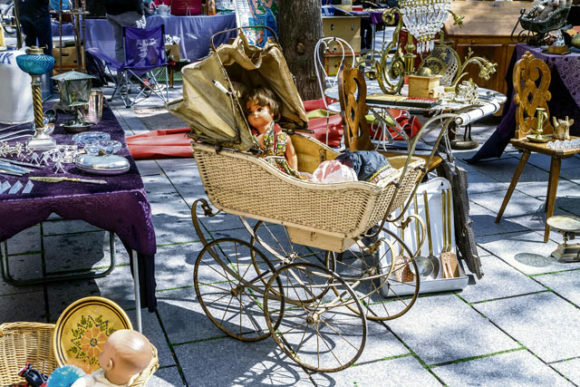 A huge brocante is held once a month in Metz and other ones much further away happen in towns along the east coast on the Atlantic. These might seem too far with regard to driving distance but they afford chances, too, to find inexpensive lodging along the way and explore some of Europe’s historic areas. Check out the site www.agendadesbrocantes.fr for info as you plan your trip. One of the best area markets happens at Silenrieux, Belgium, operating every Sunday and featuring lots of antiques and collectibles in a large, indoor market hall. The market has grown immensely from the days in the 1970s and 80s when cars would just pull up, throw open the trunk, and sell whatever they had. Today, there are often close to 150 vendors offering their treasures. In Rochefort, Belgium, visiting the brocante is worth it if only for the time spent in the quaint little village and surrounding area. Red marble quarries in the area offer tours, and scattered small breweries offer locally brewed beers. Rochefort has an annual outdoors flea market Sunday, this year July 15, and will have up to 80 vendors. Household goods to collectibles to antiques are for sale, the only thing is there is no electricity to test appliances, so there is no guarantee it will work when you get it home. In Tongeren, Belgium, it was previously possible to buy an entire solid wood office set, including a swivel chair and beautiful desk, plus shelving for less than 300 dollars. Vans containing all types of office furniture arrive early in the morning on market days to set up their displays. Tongeren also has a lot of newish-looking clothing that sells cheap and there are booths with lots of household furnishings. A good number of French and Belgian brocante listings can be found on the Internet at www.quefaire.be/brocantes or www.francebrocante.fr/. Be sure to use a browser that allows translation to English. The site is easy enough to read and discern information about where and when to go to specific markets. 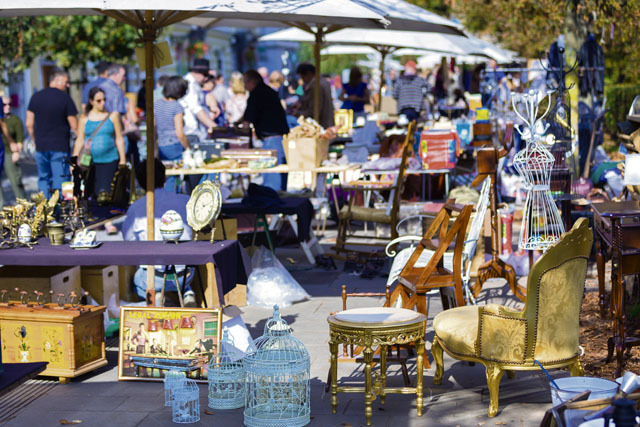 Planning ahead and doing research to find out if you will make a long weekend out of it, or just a day trip, is the top priority when trying to get the best experience from your brocante quest. And of course always ensure you have plenty of euro with you and don’t forget to bargain for that gorgeous piece.